Louis XVII (27 March 1785 – 8 June 1795), born Louis-Charles, was the younger son of King Louis XVI of France and Queen Marie Antoinette. He was at birth given the title Duke of Normandy. His older brother, Louis Joseph, died in June 1789, a little over a month before the start of the French Revolution. At his brother's death he became the heir apparent to the throne and the Dauphin of France, a title he held until 1791, when the new constitution accorded the heir apparent the style of Prince Royal of France. Louis-Charles de France was born at the Palace of Versailles, the second son and third child of his parents, Louis XVI and Marie-Antoinette. He was named after his father and his mother's favourite sister Maria Carolina, Queen of Naples and Sicily, who was known as Charlotte in the family, Charles being the masculine version of her name. His younger sister, Sophie, was born a little over a year later. He became the Dauphin on the death of his elder brother, Louis-Joseph, on 4 June 1789. "Madame de Rambaud was officially in charge of the care of the Dauphin from the day of his birth until 10 August 1792; in other words, for seven years. During these seven years, she never left him, she cradled him, took care of him, dressed him, comforted him, and scolded him. 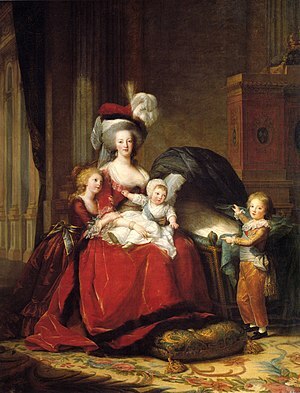 Many times, more than Marie Antoinette, she was a true mother for him". Some have suggested that Axel von Fersen, who was romantically linked with Marie Antoinette, was the father of her son. 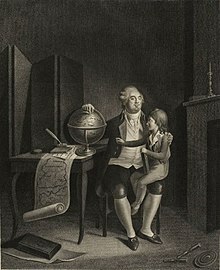 The fact that Louis Charles was born exactly nine months after he returned to court was noted, but this theory was debunked by most scholars, who reject it, observing that the time of his conception corresponded perfectly in the time that Louis XVI and Marie Antoinette had spent a lot of time together. Marie Antoinette, who gained massive weight because of her pregnancies, including this one (she was described as "very fat" by the king of Sweden), retained her charisma with an imposing figure in her court, where she had lot of admirers, but she remained a faithful, strong-willed wife and a stern but loving mother. On 6 October 1789, the royal family was forced by a Parisian mob mostly composed of women to move from Versailles to the Tuileries Palace in Paris, where they spent the next three years as prisoners under the daily surveillance of the national guards who did not spare any humiliation to the royal family; at that time Marie Antoinette was always surrounded by guards, even in her bedroom at night and these guards were present when the Queen was allowed to see her children. The family lived a secluded life, and Marie Antoinette dedicated most of her time to her two children under the daily surveillance of the national guards who kept her hands behind her back and searched everybody from the Queen to the children to see if any letters were smuggled to the royal prisoner. On 21 June 1791, the family tried to escape in what is known as the Flight to Varennes, but the attempt failed. After the family was recognized, they were brought back to Paris. When the Tuileries Palace was stormed by an armed mob on 10 August 1792, the royal family sought refuge at the Legislative Assembly. At his birth, Louis-Charles, a Fils de France ("Son of France"), was given the title of Duke of Normandy, and, on 4 June 1789, when Louis Joseph, Dauphin of France, his elder brother, died, the four-year-old became Dauphin of France, title he held until September 1791, when France became a constitutional monarchy. Under the new constitution, the heir-apparent to the throne of France, formerly "Dauphin", was restyled Prince Royal. Louis-Charles held that title until the fall of the monarchy on 21 September 1792. At the death of his father on 21 January 1793, royalists and foreign powers intent on restoring the monarchy held him to be the new king of France, with the title of Louis XVII. From his exile in Hamm, in today's North Rhine-Westphalia, his uncle, the Count of Provence and future Louis XVIII, who had emigrated on 21 June 1791, appointed himself Regent for the young imprisoned king. Louis XVI taking care of the education of his son in the Temple, (Musée de la Révolution française). Immediately following Louis XVI's execution, plots were hatched for the escape of the prisoners from the Temple, the chief of which were engineered by the Chevalier de Jarjayes [fr], the Baron de Batz, and Lady Atkyns. All came to nothing. On 3 July, Louis-Charles was separated from his mother and put in the care of Antoine Simon, a cobbler who had been named his guardian by the Committee of Public Safety and tasked to transform the former young prince into a staunch republican citizen. On 6 October, Pache, Chaumette, Jacques Hébert and others visited him and secured his signature to charges of sexual molestation against his mother and his aunt. The next day he met with his elder sister Marie-Thérèse-Charlotte for the last time. On 19 January 1794, the Simons left the Temple, after securing a receipt for the safe transfer of their ward, who was declared to be in good health. A large part of the Temple records from that time onward disappeared under the Bourbon Restoration, making knowledge of the facts impossible. Two days after the departure of the Simons, Louis-Charles is said by the Restoration historians to have been put in a dark room which was barricaded like the cage of a wild animal. The story runs that food was passed through the bars to the boy, who survived despite the accumulated filth of his surroundings. Louis-Charles was then taken out for fresh air and walks on the roof of the Tower. From about the time of Gomin's arrival, he was inspected, not by delegates of the Commune, but by representatives of the civil committee of the 48 sections of Paris. The rare recurrence of the same inspectors would obviously facilitate fraud, if any such was intended. From the end of October onward, the child maintained an obstinate silence, explained by Laurent as a determination taken on the day he made his deposition against his mother. On 19 December 1794 he was visited by three commissioners from the Committee of Public Safety — J. B. Harmand de la Meuse, J. B. C. Mathieu and J. Reverchon — who extracted no word from him. On 31 March 1795, Étienne Lasne was appointed to be the child's guardian in replacement of Laurent. In May 1795, the boy was seriously ill, and a doctor, P. J. Desault, who had visited him seven months earlier, was summoned. However, on 1 June, Desault died suddenly, not without suspicion of poison, and it was some days before doctors Philippe-Jean Pelletan and Dumangin were called. Louis-Charles died on 8 June 1795. The next day an autopsy was conducted by Pelletan, at which it was stated that a child apparently about ten years of age, "which the commissioners told us was the late Louis Capet's son", had died of a scrofulous infection of long standing. "Scrofula" as it was previously known, is nowadays called Tuberculous cervical lymphadenitis referring to a lymphadenitis (chronic lymph node swelling or infection) of the neck (cervical lymph nodes) lymph nodes associated with tuberculosis. Louis-Charles was buried on 10 June in the Sainte Marguerite cemetery, but no stone was erected to mark the spot. A skull was found there in 1846 and identified as his, though later re-examination in 1893 showed it to be from a teenager and therefore unlikely to be his. Following a tradition of preserving royal hearts, Louis-Charles's heart was removed and smuggled out during the autopsy by the overseeing physician, Philippe-Jean Pelletan. Thus, the heart of Louis-Charles was not interred with the rest of the body. Dr. Pelletan stored the smuggled heart in distilled wine in order to preserve it. However, after 8 to 10 years the distilled wine had evaporated, and the heart was further kept dry. After the Restoration in 1815, Dr. Pelletan attempted to give the heart to Louis-Charles's uncle, Louis XVIII, however he refused because he could not bring himself to believe that was the heart of his nephew. Dr. Pelletan then donated the heart to the Archbishop of Paris, Hyacinthe-Louis de Quélen. Following the Revolution of 1830, and the plundering of the palace, the son of Pelletan found the relic in the remnants of the palace and placed it in the crystal urn, in which it still resides today. After his death in 1879, Eduard Dumont received the heart. In 1895, the nephew of the Archduchess Maria Theresa of Austria-Este, Don Carlos de Bourbon, a pretender to the throne of Spain accepted the relic from a friend of Eduart Dumont, Paul Cottin. The relic was held near Vienna, Austria at the castle of Frohsdorf. The son of Carlos, Jaime, Duke of Madrid, in 1909 inherited the heart, and gave it to his sister, Beatriz. Finally two granddaughters of Don Carlos offered the heart to the president of the Memorial of Saint-Denis in Paris, Duc de Bauffremont, where he put the heart and its crystal urn in the necropolis of the Kings of France, the burial place of Louis-Charles's parents and other members of the French royal family. In December 1999, public notaries witnessed a section of the heart muscle of the aorta removed from the rest of the heart, and the transfer of the samples into a sealed envelope, and then the opening of the sealed envelope in the laboratory to be tested. Scientists using DNA samples from Queen Anne of Romania, and her brother Andre de Bourbon-Parme, maternal relatives of Louis XVII, thus proved the young royal's identity. As rumors quickly spread that the body buried was not that of Louis-Charles and that he had been spirited away alive by sympathizers, the legend of the "Lost Dauphin" was born. When the Bourbon monarchy was restored in 1814, some one hundred claimants came forward. Would-be royal heirs continued to appear across Europe for decades afterward and some of their descendants still have small but loyal retinues of followers today. Popular candidates for the Lost Dauphin included John James Audubon, the naturalist; Eleazer Williams, a missionary from Wisconsin of Mohawk Native American descent; and Karl Wilhelm Naundorff, a German clockmaker. However, DNA testing conducted in 1993 proved that Naundorff was not the Dauphin. Karl Wilhelm Naundorff's story rested on a series of complicated intrigues. According to him, Barras determined to save the dauphin in order to please Joséphine de Beauharnais, the future empress, having conceived the idea of using the dauphin's existence as a means of dominating the comte de Provence in the event of a restoration. The dauphin was concealed in the fourth storey of the Tower, a wooden figure being substituted for him. Laurent, to protect himself from the consequences of the substitution, replaced the wooden figure with a deaf mute, who was presently exchanged for the scrofulous child of the death certificate. The deaf mute was also concealed in the Temple. It was not the dead child, but the dauphin who left the prison in the coffin, to be retrieved by friends before it reached the cemetery. Naundorff arrived in Berlin in 1810, with papers giving the name Karl Wilhelm Naundorff. He said he was escaping persecution and settled at Spandau in 1812 as a clockmaker, marrying Johanna Einert in 1818. In 1822 he removed to Brandenburg an der Havel, and in 1828 to Crossen, near Frankfurt (Oder). 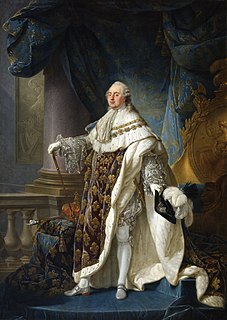 He was imprisoned from 1825 to 1828 for coining, though apparently on insufficient evidence, and in 1833 came to push his claims in Paris, where he was recognised as the dauphin by many persons formerly connected with the court of Louis XVI. Expelled from France in 1836, the day after bringing a suit against the duchess of Angoulême for the restitution of the dauphin's private property, he lived in exile until his death at Delft on 10 August 1845, and his tomb was inscribed "Louis XVII., roi de France et de Navarre (Charles Louis, duc de Normandie)". The Dutch authorities who had inscribed on his death certificate the name of Charles Louis de Bourbon, duc de Normandie (Louis XVII) permitted his son to bear the name de Bourbon, and when the family appealed in 1850–51, and again in 1874, for the restitution of their civil rights as heirs of Louis XVI, no less an advocate than Jules Favre pled their cause. Another pretender was Reverend Eleazar Williams, a Mohawk-born Protestant missionary, and an advocate for land rights of Native Americans. While at the house Francis Vinton, William began shaking and trembling upon seeing a portrait of Antoine Simon, a member of the sans-culottes, claiming the portrait has "haunted me, day, and night, as long as I can remember." Simon was rumored to have physically abused the dauphin while he was imprisoned at the Temple. Francis Vinton was convinced by Eleazar William's reaction, that Williams was Louis-Charles. Williams claims he has no recollection of how he escaped his imprisonment at the Temple, or his early years in France. He was a missionary to Native Americans when the prince de Joinville, son of Louis-Philippe, met him, and after some conversation asked him to sign a document abdicating his rights in favour of Louis-Philippe, in return for which he, the dauphin (alias Eleazar Williams), was to receive the private inheritance which was his. This Eleazar Williams refused. Williams's story is generally regarded as false. Strangely, the account of the substitution in the Temple deceived royalists and republicans alike. Lady Atkyns was trying by every possible means to get the dauphin out of his prison when he may already have been in safe hands. A child was in fact delivered to her agents, but he was a deaf mute. That there was a complicated fraud on the guardians of the dauphin was considered by a succession of writers from 1850 onwards, and more recently by Frédéric Barbey, who wisely attempts no ultimate solution. When the partisans of Richemont or Naundorff come to the post-Temple careers of their heroes, they become in most cases so uncritical as to be unconvincing. By 1900, there were over 100 pretenders who had presented themselves to be the "lost-dauphin". The popularity of the false-dauphins peaked in the wake of the 1830 Revolution, and waned over the course of the century. Unlike the deaths of his parents which were a national spectacle, the dauphin's death was a matter of administrative and medical record, consequently easier to repudiate. The myth of the substition before the death of Louis-Charles was popularized and encouraged by Jean-Joseph Regnault Warin's immense popular novel Le Cimetière de la Madeleine in 1800. Pretenders increased in regularity after the accession of King Louis XVIII in the Bourbon Restoration. Following the Revolution of 1830 pretender claims were treated with heightened seriousness in France because of their ability to serve as critiques of the King Louis XVIII. The premise of a Bourbon claimant challenging the legitimacy of Louis-Phillppe's legitimacy, certainly served as the reason for the aggression of which the pretenders were pursued in the courts. In 2000, Philippe Delorme arranged for DNA testing of the heart as well as bone samples from Karl Wilhelm Naundorff. Ernst Brinkmann of Münster University and Belgian genetics professor Jean-Jacques Cassiman of Katholieke Universiteit Leuven, conducted mitochondrial DNA tests in 2000 using samples from Marie-Antoinette, her sisters Maria Johanna Gabriela and Maria Josepha, their mother, Maria Theresa, and two living direct descendants in strict maternal line of Maria Theresa, Queen Anne of Romania and her brother, Prince André de Bourbon Parme. The tests proved that Naundorff was not the dauphin, and the heart was that of Louis-Charles. 1991 – Killer Tomatoes Eat France played by Steve Lundquist. The museum of the French Revolution organizes from June 29 to October 1, 2018 an exhibition on Louis XVII. ^ a b This article incorporates text from a publication now in the public domain: Chisholm, Hugh, ed. (1911). "Louis XVII. of France" . Encyclopædia Britannica. 17 (11th ed.). Cambridge University Press. p. 45. ^ Alain Decaux, Louis XVII retrouvé, 1947, p. 306. "Gallica". BNF. ^ a b Nagel, Susan (2009). Marie-Thérèse: the fate of Marie Antoinette's daughter. London: Bloomsbury Publishing. p. 137. ISBN 978-0-7475-9666-0. ^ "French boy king's heart to be buried in crypt". Kingsport Daily News. Paris. Reuters. 7 June 2004. p. 1. ^ (in French) petit-bulletin.fr, Heurs et malheurs de Louis XVII, arrêt sur images. (in French) Philippe Delorme's website (one page in English). (in French) Details about the DNA analysis of the heart believed to be that of Louis-Charles. Karl Wilhelm Naundorff was a German clock- and watch-maker who until his death claimed to be Prince Louis-Charles, or Louis XVII of France. Naundorff was one of the more stubborn of more than thirty men who claimed to be Louis XVII. 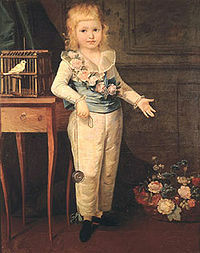 Louis Joseph de France was the second child and elder son of King Louis XVI of France and Marie Antoinette. As son of a king of France, he was a fils de France, and as the eldest son and heir apparent, he was Dauphin of France,. Marie Adélaïde de France,, was a French princess, the fourth daughter and sixth child of King Louis XV of France and his consort, Marie Leszczyńska. Agathe de Rambaud was born in Versailles as Agathe-Rosalie Mottet and was baptized in the future cathedral Saint-Louis of Versailles, on 10 December 1764. She died in Aramon, in the département of Gard, on 19 October 1853. She was the official nurse of the royal children, and particularly in charge of the Dauphin from 1785 to 1792. Alexander Kucharsky also Alexandre Kucharsky, was a Polish portrait painter who spent his adult life in France. He himself used the spelling Kucharsky, but Kucharski is also often used. In the past, in France, the name has been given as Couaski.